Resin is a type of solid surface countertop but with more variations. It is produced in a pleasing array of colors and textures. Pros and Cons of Resin Countertops: On the plus side, resin counters are very durable, impact-resistant and very easy to clean. Most hold their color very well, even in direct sunlight. Small scratches or nicks can be sanded out of the countertop. Newer resin tops can be made with less pigment, giving them a semi-opaque, translucent quality. This is ideal for backlighting the countertops, giving them a very unique appearance. The key potential negative for resin countertops is the lack of consistent quality from brand to brand. 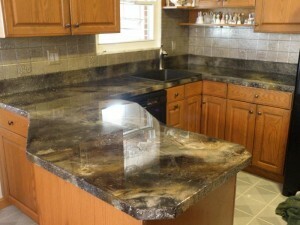 Look for acrylic or Epoxy Resin Countertops and avoid polyester resin countertops. 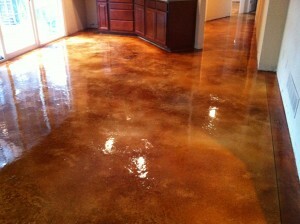 Resin Price Range: $51-$127 per square foot. Wicked New Floor DESIGNS Coming Soon!! Comments Off on Wicked New Floor DESIGNS Coming Soon!! This bathroom floor had tile. 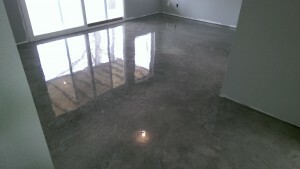 We applied a polymer based concrete over the tile so we could start with a flat surface. 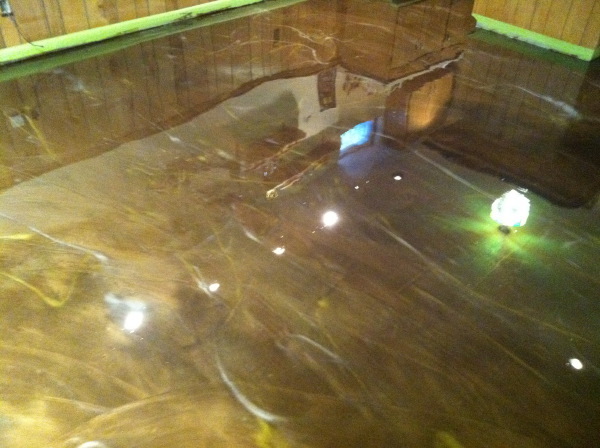 We then resurfaced it with a Pearl Marble Glaze epoxy and added multiple acetone base stains. While the epoxy cured it gave us this really wicked design. The look is a little much for some people, but most everyone seems to love it. 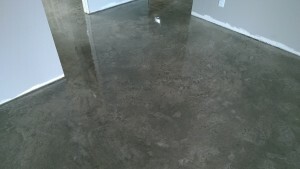 This finish is perfect for Residential settings such as living areas, basements or garage floors. Perfect way to brighten and awe customers in commercial areas such as retail spaces, shopping malls, auto dealerships, medical offices, restaurants, or more!! 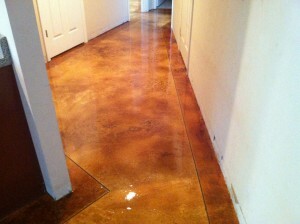 Limitless colors with a seamless look this finish is becoming a trend in retail, commercial and residential flooring. Metallic Marble is industrial grade that is durable in high traffic areas and easy to clean with scratch and slip resistance options. 20 Year Old Concrete Gets a Modern Day Makeover. Comments Off on 20 Year Old Concrete Gets a Modern Day Makeover. 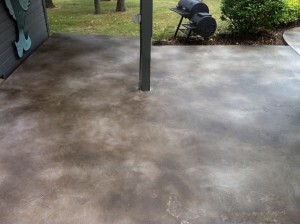 We started this Project with Concrete that was about 20 years of age, it had several cracks and some stained area’s, part of the concrete was just added within the last year, so the colors of the two slabs of concrete was way different, my client wanted to have the cracks repaired and make the New and Old concrete colors blend together and look as one single slab, and that’s exactly what we did. Our First task was to do some grinding, open the cracks up and get them repaired, after that we had to get the concrete prepped and ready for a Brand New Overlay with some Acid Staining. The Base coats went down great and the two large slabs of concrete now looked like they were the same color, the texture was a rock trowel, once the texture was on we put plastic on the home and the screened in patio area. Next step was to Acid Stain the entire surface to pull it all together and marbleize the surface, we used a Chocolate and a Charcoal Colorant to add into our Antiquing Stains, so we were looking for a taupe color, once we had the color blend we were looking for we started the Acid Staining Process. The Final step was to Lock it all in with a Quality Sealer and make the concrete look new and revived, I believe we saved the home owner from having to tear out and re-place the entire slab of Old Concrete which would have cost about 20k, needless to say they were very happy, please enjoy the pictures located here I will have a Video up very soon.